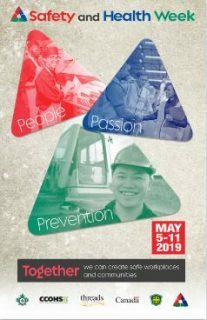 The goal of Safety and Health Week (formerly known as NAOSH) is to focus employers, employees, partners and the public on the importance of preventing injury and illness in the workplace, at home, and in the community. 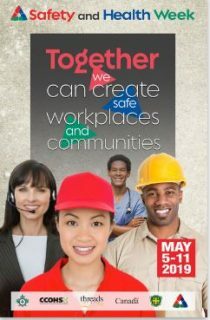 This goal seeks to improve attitudes towards safety, increase understanding of the importance of occupational safety and health, foster a safety-minded culture with increased cooperation and assist in team building and improved communication between employees and employers, safety committees and safety professionals. 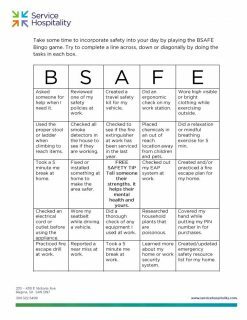 Incorporating an internal BINGO safety contest for all staff to participate in to win a prize! What are you doing to engage your staff during this week? If you have an OH&S committee in your workplace, ensure you contact us to receive FREE SWAG to give away as prizes during your safety activities during the week. Over the last 2 years, we distributed FREE SWAG to over 57 OH&S Committees across the province! We are supporting this safety initiative by posting Safety and Health Week Posters throughout our office and think you should too! 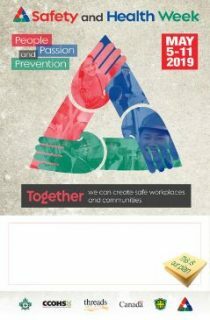 Click here for safety posters as well as ideas on what to post during Safety and Health Week on your social media feeds to help spread the word! To mark this important week within YOUR organization, click here for event activities and suggestions! Ensure your workplace is safe not just during the week but every day of the calendar year!